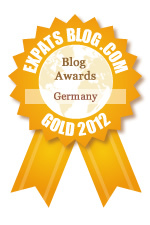 ExpatsBlog.com Expat Blog Awards 2012: Germany Gold Award! Think this is a very informative, well layed out blog that is extremely usefull for Families that have moved to another country. Also who better to give advice and information than someone who has been through it all. Fanatastic!! WELL DONE. Useful and informative. Will share this resource with all my colleagues. This blog is a fabulous resource, it's reassuring, concise, informative and easy to navigate. Invaluable. Brilliant blog, full of great info. fabulous blog written by a very talented lady who I admire greatly! I discovered this blog via twitter after answering a question about what we pack when flying with our children. Now, I've been sharing it with all my expat friends - I only wish it had been there when we first went overseas with our babies. Hugely informative, superbly laid out and great fun to read - a really useful resource. Really informative and collaborative. I really enjoy following this blog. What a pleasure to read 'Your Expat Child'. Full of useful information in fun constructive point of view. Having experienced it all myself with my family, this blog makes me smile and brings back fond memories of our similar experiences. It is spot on - thank you!!!!!!! A great blog for parents, relations of children everywhere, keep up the good work. A really great blog with lots of useful information for anyone moving abroad with children. Really helpful resource with something for everyone - from new expats to old ones (er, perennial expats!) I always pick up a helpful tip or three whenever I visit Carole's blog. A great read, and really helpful and informative. Informative, engaging and insightful blog about relocating with children. Hats off to Carole! It was really heartbreaking reading her blog regarding questions asked about the child and when parents of other kids started saying of what's the point in being friend with the child if she is living. If everyone of us will to feel this way(what's the point if) then we would have missed out all the good times and friendships that we could have. Thanks, Carole for the blog. As an expat who had children abroad but who expects to move on to pastures new this blog is a fascinating and useful resource for me! Love! Informative & helpful. Sharing My Desire to share & facilitate for families exploring the world. A great blog with many things we can relate to! A fascinating window into the world of a expat family. fabulous, witty and informative, love it! Great blog - hits the important issues around being an expat. Fabulous website - full of useful hints and tips, all written with humour and understanding by someone who really DOES know how you feel! Interesting and informative. A great read! What a great site. So much useful information. Really helpful. Full of great information that I really need as an Expat with 3 kids. Informative, easy to navigate and all in all a fantastic blog. Super. Full of so much useful information! Her blog maybe new, but she knows what she is writing about. Great resource for expat parents. I love Carol's blog, it's super informative and helpful Well done, Carol! Great blog, very informative and mind broadening. An excellent blog for expatriate families everywhere. Useful articles on a wide range of topics, this blog is a very valuable resource for those raising Third Culture Kids. Super-helpful tips for parents navigating expat life. One of the best resources for expats.